1 X PetSafe Staywell Original 2 Way Pet Door. 1 X Installation Guide. You are greatly appreciated! The Staywell 300 Grey Cat Flap has the following features : --- 4 Way locking cat flap --- See-through rigid flap --- Control your cat with the Manual 4 way security lock: In Only - Out Only - Opened - Locked --- Universal fitting for windows, walls and doors --- For cats up to 7kg (15lbs) ---Suitable for fitting into glass --- Extension tunnels available for wall installation (Sold separately) --- Spare flaps available ---Easy to clean --- 3 Year Guarantee Overall Size: 241mm x 252mm (9 1/4" x 9 3/4") Cut Out Size: 168mm x 175mm (6 1/2" x 6 3/4") Glass cut out: 212mm (8 3/8") diameter circle. Maximum Shoulder Width: 150mm (5 7/8"). Maximum pet shoulder width: 147mm (53/4"). Maximum pet weight: 7 kg (15 lbs) - cats and small dogs. Cut out size: 185 mm x 158 mm (71/4" x 61/4"). Colour: White. Barrier locking system. 4 way locking cat flap with see through rigid flap. In Only - Out Only - Opened - Locked. Universal fitting for windows, walls and doors. For cats up to 7kg (15lbs). Overall Size: 241mm x 252mm (9 1/4in x 9 3/4in). Cut Out Size: 168mm x 175mm (6 1/2in x 6 3/4in). Glass cut out: 212mm (8 3/8in) diameter circle. Maximum Shoulder Width: 150mm (5 7/8in). Ideal way to give your cat freedom or control her access to your home Set the door to open, closed, in only or out only Can be installed in thicker door/walls using stay well 310 tunnel extensions For cats up to 7 kg Fits standard windows, walls and doors up to 5 cm thick Welcome to our Shop! 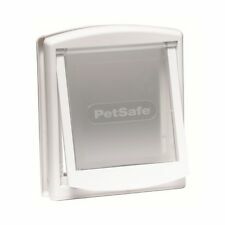 Petsafe Original 2 Way Small Pet Door. White Barrier locking system|Overall size: 236 mm x 198 mm (91/4" x 73/4")|Cut out size: 185 mm x 158 mm (71/4" x 61/4")|Maximum pet shoulder width: 147mm (53/4")|Maximum pet weight: 7 kg (15 lbs) - cats and small dogs . PetSafe Staywell Manual 4 Way Locking Classic Cat Flap White - No Tunnel 919EF Posted Today If Paid Before 2pm Product Features ---For dogs and cats up to 7 kg ---Rigid, transparent plastic flap ---Durable plastic frame ---Fits doors up to 5.7cm thick (with tunnel) or up to 1cm thick (without tunnel) ---Manual 4-Way lock: in only, out only, open and locked Description PetSafe has classic door with locking options. The four-way lock offers the in flexibility, set the door to open, closed, in only or out only. It is available in white with or without a tunnel. Box Contains 1 x Staywell Classic Manual 4-Way Locking Cat Flap. Wicklow - Staywell® Original 2-Way Pet Door - Small Brown. Supplied with a closing panel for when it’s not in use or for keeping your pet safely indoors. Suitable for most doors and walls. Provides an easy way out for your pet. Cat Mate Elite I.D. Disc Cat Flap With Timer Control In White For Cats Without Microchips Cat Mate Elite I.D. Disc Cat Flap With Timer Control In White For Cats 305W POSTED TODAY IF PAID BEFORE 1PM! Features ---Entry and exit controlled by electronic i.d. (2 i.d.s included in delivery) for up to 9 cats - thus keeping all other animals away ---Lcd display indicates selected access and inlet status and location and time details since last operation of the flap for up to 3 cats ---Battery status indicator. 4 x aa batteries required (not included in delivery) ---Timer-function controls the access for all of your cats (e.g. preventing exit at night) ---Self-cladding for mounting depths up to 50 mm - suitable for single and double glazing and all panels up to a thickness of 50 mm. tunnel for wall installation available. Product Dimensions: 26. 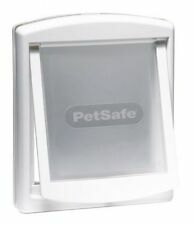 Petsafe Staywell Magnetic 4Way Deluxe Cat Flap. Wicklow - Staywell® Deluxe Manual Cat Flap - Grey. 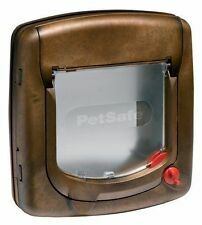 PetSafe Staywell Deluxe Manual 4 Way Locking Cat Flap Woodgrain. Set the door to open, closed, in only or out only. This will allow you to tempt pets through using a favourite treat. Wicklow - Staywell® Deluxe Magnetic Cat Flap - Wood Grain. Staywell magnetic cat flap works via magnetic key. The Staywell Magnetic 4 Way Locking Classic Cat Flap works with the use of a magnet. Only your cat can enter through the magnetic key around his neck. With the help of the Quick installation guide, the Manual 4 Way Locking Classic Cat Flap can be fitted into Walls and Doors of any material Easily. INDEPENDENCE - The flexible 4 Way Locking system gives your Cat a greater area of exploration and freedom; catering to their curious nature and keeping them active. Pet Mate Elite Selective Micro Chip Cat Flap With Timer Control - White (355W) The Cat Mate Elite Microchip Cat Flap with Timer Control is the perfect solution for selective entry control, operated by your cat’s implanted identification microchip. This eliminates the problems caused by the unwelcome intrusion of neighbouring cats, providing a safe and secure environment for your cat. Once your cat’s microchip has been registered, the Timer Control function can be programmed to select access times for all your cats through the cat flap, e.g. to keep cats in at night. Up to 9 cats can be registered. For cats without an implanted microchip, a unique Cat Mate I.D. Disc can be attached to your cat’s collar (available separately). Wicklow - Staywell® Deluxe Manual Cat Flap - Wood Grain. PetSafe Staywell Deluxe Manual 4 Way Locking Cat Flap Woodgrain. Locking options include in only, out only, fully open and fully locked. The Manual cat flap is suitable for any door, wall or material and can be extended to any depth for wall fitting. CLASSIC BROWN GLASS & WOOD PET DOOR CAT FLAP. INCLUDES BRUSH WEATHER STRIP HELPING TO KEEP DRAUGHTS OUT. FLAP SIZE : 155MM X 150MM. HIGH IMPACT 100% POLYCARBONATE FLAP. LOW MAINTENANCE SELF-LINING DOOR & SELF-CLOSING FLAP. 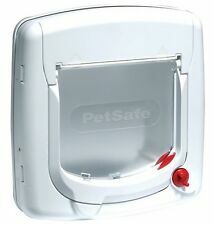 STAYWELL PETSAFE 919 WHITE - Cat Flap Pet Door 4 Way Locking - FREE UK P&P! This flap is suitable for fitting to single pane glass and thin panel doors up to 6mm (1.4"). Pet Max shoulder width: 162mm (6 3/8"). Cut out size wood: 169mm x 169mm (6 5/8" x 6 5/8"). 5 out of 5 stars - STAYWELL PETSAFE 919 WHITE - Cat Flap Pet Door 4 Way Locking - FREE UK P&P! 5 product ratings5 product ratings - STAYWELL PETSAFE 919 WHITE - Cat Flap Pet Door 4 Way Locking - FREE UK P&P! 1 x Cat Flap. 1 x Tunnel to fit Cat Flap. 4 locking options: in only out only opened and locked. It has 4 way security- In Only Out Only Open or Locked. Wipe down easy clean. Cut out size: 169 mm x 169 mm (6 5/8" x 6 5/8"). This pet flap provides ease of access for your pet. Low maintenance self closing flap with brush weather seal, reduces drafts and noise. A generous sized flap to suit all cat breeds; 175 x 170 mm. A strong, high impact 100% poly carbonate flap UV stabilised and virtually unbreakable. Small Pet Door WHITE or BROWN. Maximum pet shoulder width 147mm 5 3 / 4. Weather resistant self closing see through magnetic flap. Cut out size 180mm x 155mm 7 1 / 8 x 6 1 / 8. For cats up to 7kg 15lbs and small dogs up to 3kg 7lbs. 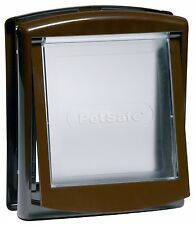 PetSafe Magnetic 4-Way Cat Flap Deluxe 420 Brown 5006. Put the included magnetic collar key on your cat, which will unlock the cat flap for your cat! It is suitable for cats of up to 7 kg. This energy-efficient cat door is easy to install with its universal fitting for windows, walls and doors of up to 5 cm thick. This PetSafe manual cat flap Deluxe 320 gives your cat a free pass to enter or leave the house even when the door is shut! It is suitable for cats of up to 7 kg. 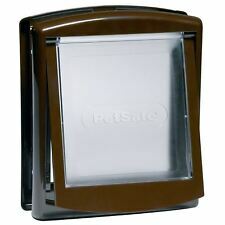 PetSafe Manual 4-Way Cat Flap Deluxe 320 Brown 5003. Petsafe's original 2 way locking pet door is a simple barrier locking system that allows your cat or dog in and out of the house. We're a bit different, like your pet. Every pet has their own personality. This provides pets with a greater freedom of choice end extends the areas in which they can self-exercise and explore. Locking options include in only, out only, fully open and fully locked. The Manual cat flap is suitable for any door, wall or material and can be extended to any depth for wall fitting. Selective entry / Manual 4 Way Locking Cat Flap - WHITE No. 919. See through, tough and weather resistant flap. Greater degree of security. Cut out size: 169mm x 169mm (6 5/8" x 6 5/8"). Installation depth: up to 6mm (1/4"). Implanted microchip or RFID collar disc. Lock Options: 4 Way. as well as the Cat Mate RFID collar disc. the last cat used the flap. Ferplast 4-Way Manual Pet Flap Swing 11T White 72106011. The Swing 11T 4-way manual cat flap from Ferplast is a pet door devoted exclusively to your four-legged friend. With full tunnel. Colour: White. Magnetically Operated Cat Flap - WOODGRAIN - with see through flap. Only pets wearing the magnetic collar key can use the door. Cut out size: 168mm x 175mm (6 1/2" x 6 3/4"). Set the door to open, closed, in only or out only. Small Pet Door BROWN. Maximum pet shoulder width 147mm 5 3 / 4. Cut out size 180mm x 155mm 7 1 / 8 x 6 1 / 8. For cats up to 7kg 15lbs and small dogs up to 3kg 7lbs. Overall size 236mm x 198mm 9 1 / 4 x 7 3 / 4. Weather resistant self closing see through magnetic flap. Maximum pet shoulder width 219mm 8 5 / 8. Cut out size 265mm x 230mm 10 3 / 8 x 9. Overall size 352mm x 294mm 13 7 / 8 x 11 1 / 2. Selective entry / Manual 4 Way Locking Cat Flap WHITE No. See through, tough and weather resistant flap. Accessories Dog & Cat Doors Dog & Cat Doors. Greater degree of security. Cut out size 169mm x 169mm 6 5 / 8 x 6 5 / 8. 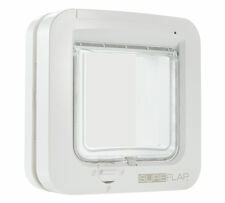 SureFlap DualScan Microchip Cat Flap White Microchip Fast Dual Two Cat Kitten The SureFlap DualScan Microchip Cat Flap identifies your cats by using their unique identification microchip, unlocking only for your pet and preventing unwanted strays and neighbourhood cats from entering your home. The SureFlap DualScan Microchip Cat Flap is suitable for multi-pet households to control the access of your pets both into and out of the house. This allows you to restrict some pets to indoors-only, while others are allowed outside and back in again. Any intruder animals attempting entry are kept out. 4 Way locking cat flap SILVER With see through rigid flap. Accessories Dog & Cat Doors Dog & Cat Doors. Manual 4 way security lock In Only Out Only Opened Locked. Cut Out Size 168mm x 175mm 6 1 / 2 x 6 3 / 4.